Editors from FindMySoft site created short video for ShixxNOTE program. So now you can look video at the program home page site or here. Video is very cool. Still I have plan to release more video material for ShixxNOTE especially about sending notes. Because in this video there is only just a quick look at the program. 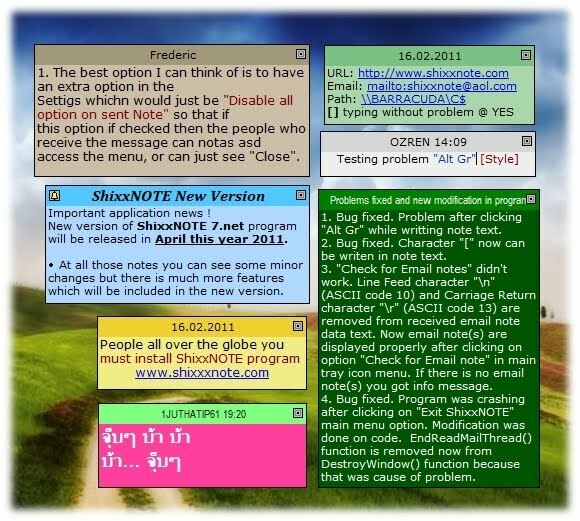 But I always say that ShixxNOTE is not just simple desktop sticky note program, it is also LAN messenger program with many communication options. Click play and enjoy this short video ! Let's say you have company on three floors, and you have 5 managers in your company. And you decided to have a meeting at 11am. But you don't want to go on the third floor just to say your sales manager about meeting. Instead of that you can use ShixxNOTE for that. 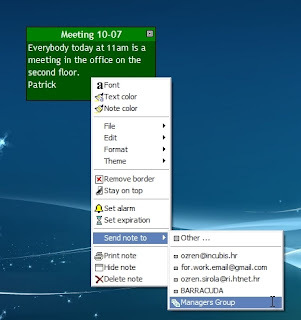 First you create note and write on it when and where is meeting. When you get "Send note to" other dialog, you must click on every manager you want to be present, but let's say you always have meeting with same managers. First time you click or enter IP address of every manager, but then you click on "Save Group" button on "Send note to" other dialog. 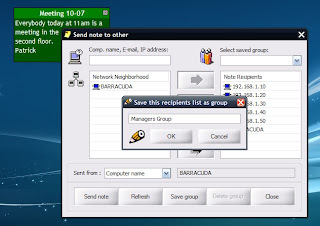 Then program will ask you to enter group name for saved recipients. That will be here "Managers Group". See picture below. 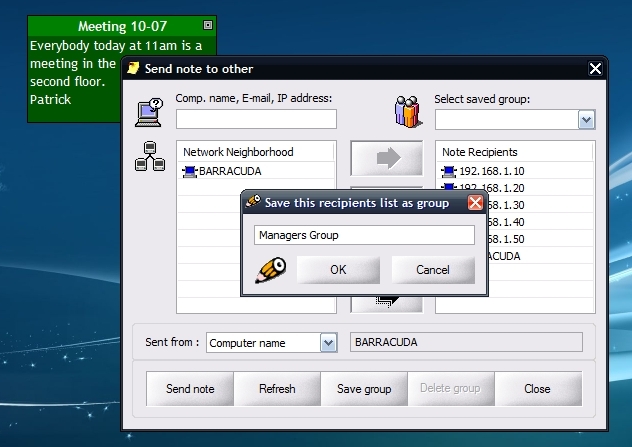 Your group "Managers Group" will appear in the list box above the recipients list. So any time later when you want to call a meeting again with same persons you will just select "Managers Group" from list of saved group. You can have how many you want saved groups. After that your group is saved as a "Managers Group". 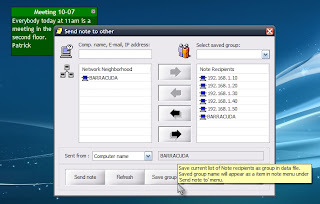 So you can always select it from list in send note to other dialog and add some more recipients or one ideal solution is that all your saved groups will appear in note menu "Send note" and you will see your saved group "Managers Group". 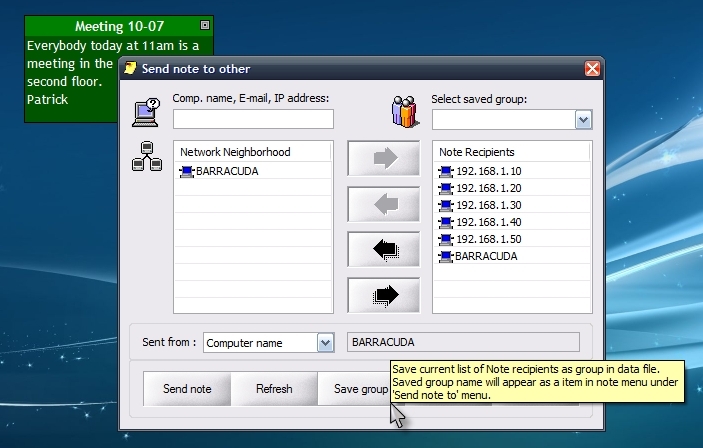 And click on it and all recipients in saved group will receive note promptly. You can also see that Group with more than one recipient in it will have different icon (many small boxes).